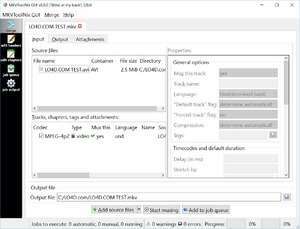 MKVToolnix is a totally free video conversion utility which provides user the ability to create and edit MKV files, also known as Matroska Video files. MKV files have become the new AVIs on the Internet and every single day, you're likely to come across more of them as the format is adopted across the please. Though some media players still have issues with MKV files, MKVToolnix can help you make them more compatible. This video converter application supports a long list of different media formats with the most popular being AVI, WMV, OGG, SRT, MP3, MP4 and even Real Media files. Version 33.0.0 is a freeware program which does not have restrictions and it's free so it doesn't cost anything. For security reasons, you should also check out the MKVToolnix download at LO4D.com which includes virus and malware tests. Additional screenshots of this application download may be available, too. 4.5 out of 5 based on 7 ratings. MKVToolnix has a presence on social networks.